The Egyptians used the concept of Maat, personified as a goddess, to refer to the cosmic order which came into being when creation banished chaos. The word covers notions such as order, justice and truth, and means the opposite of chaos, evil ('isfet') and lies. It was considered to be the most important principle of the world. It was the king's duty to maintain this order - based on his knowledge of Maat, he issued laws. Further, he had to placate the gods with offerings so that they would not leave Egypt and abandon it to chaos. A famous stela of Tutankhamun, later usurped by Horemheb, sketches the desolate situation in which Egypt found itself after the measures taken by Akhenaten. That pharaoh, who only worshipped the god Aten, banned the cults of all other gods and denied their existance. Only after the death of Akhenaten and a return to the previous situation was Maat again restored. Both the gods and men 'lived on Maat', and one of the most important gifts from the king to the gods was a statuette of the goddess. As the king's deputy, the vizier, too, was a 'Priest of Maat'. It has been suggested that the statuette of the goddess hanging on a chain around his neck functioned as his chain of office. Not only the king but also various gods were said to be 'Lord of Maat', including the sun god Re, whose daughter Maat was considered to be, and Ptah, the god of Memphis, who is often depicted standing on a podium shaped like the hieroglyph for Maat. Osiris, too, had close links with Maat. After all, he was the judge in the judgement of the dead. In his presence, in the 'Hall of the two Maats', the heart of the deceased was weighed against the goddess, often represented by a feather. Although the goddess represents one of the most important principles of the Egyptian state, very few temples dedicated to her have been found. One of the most important is in the Karnak temple complex. 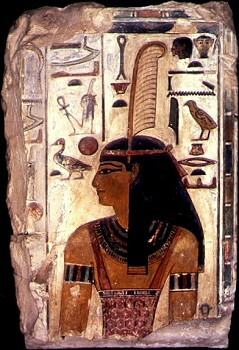 Maat is depicted as a woman with a feather on her head. The feather alone can also represent the goddess.